"Your talent as an artist and your commitment to education has enriched the lives of thousands of students." "After seeing your work on your website, the International Scientific Committee has expressed its favorable opinion for your participation in the Biennale Internazionale dell'Arte Contemporanea which will take place at the Fortezza da Basso, Firenze, Italy"
"The Re-InCardnation Project provides a rich learning environment for our community's youth. Through this innovative program, Renaissance of Papermaking has found a creative way to help teens enter the work force by encouraging environmental awareness, employment in the arts, and entrepreneurial skills." For over 30 years, Lana Jean Rose has been recognized for both her solo work and her Public Environmental Art Projects. Lana has a long history of accolades reflecting her many artistic accomplishments. Her abstract paintings and collaborative public art projects have been acknowledged by such notables as President Bill Clinton, Secretary of State Hillary Clinton, California Senator Barbara Boxer, California Congresswoman Barbara Lee, Former California Congressman Ron Dellums, and California Governor Jerry Brown. As an Environmental Public Artist, she has been commissioned by the Governments of Mexico, Spain, France, Japan, Greece and China to establish her highly acclaimed Public Art Project, "Renaissance of Papermaking". Lana has been recognized by the 2003 and 2009 Biennale Internazionale dell’Arte Contemporanea in Florence and the Venice Biennale in Italy as an internationally emerging artist who will make an artistic difference. Her art pieces are in many permanent private collections, including Bank of America, San Francisco Federal Reserve Bank, Kaiser Permanente, Japan Airlines Private Collection, The Museum of Modern Art in Dalian, China, The Museum of Modern Art in Fukuoka, Japan and The Oakland Asian Cultural Center. 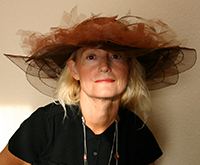 Lana has clients who have collected her work for over twenty years. During her career as a professional artist, Lana has explored many different mediums. For many years, she found the art of printmaking such as etching and monotypes exciting and a medium for a wide audience to purchase her work. This is important to Lana because she strongly believes living with art enriches family lives. Her work caught the eye of the Corporate world. After a few years, she watched the quality of printmaking paper decline. She began to explore the world of papermaking and how to make her own pigments. Soon her unique works were being exhibited in galleries nationally and she began receiving international acclaim. With the ability to produce her own pigments and paper, Lana was able to create unusual etchings and monotypes. She began adhering her paper to canvas and painted on the textured surface. During this time, Lana also became interested in public art work. She presented the City of Oakland, California with a public art project called, "Renaissance of Papermaking". With a large grant from the City of Oakland and other major foundations, she created "zero-paper waste" schools in Oakland. She gained commitment from 6th grade students in fifteen schools to be her assistants and learn everything she knew regarding papermaking. With these newly acquired skills the students taught their peers how to recycle classroom paper waste as well as learn the dying art form of the traditional Japanese method of papermaking. Originally, the project was proposed as a temporary 6-month project but by the end of it's first year, "Renaissance of Paper", became a 501-c3 non-profit. Lana soon had Oakland elementary students teaching their peers in Oakland's Sister Cities Fukuoka, Japan and Dalian, China how to recycle and create their own "zero-paper waste" school. Lana continues to reinterpret what we know as "art". Currently, Lana is creating three-dimensional assemblages and exhibiting throughout the world.